Vasant Panchami is a colorful and joyous festival celebrated by Hindus and Sikhs across India. It is also popularly called Basant Panchami in Hindi. The word ‘Vasant’ means spring and ‘Panchami’ implies the fifth day, so, as the name is, this festival is observed on the fifth day of the season of Spring. As per Hindu Calendar, this festival falls in the month of Magha on the fifth day of Shukla Paksha or the bright half which every year comes around late January or Early February. Also, the day of Vasant Panchami is decided on the basis of prevalence of Purvahna Kaal i.e. the period between sunrise and mid-day. So, when Panchami tithi prevails during Purvahna Kaal, then the celebrations of Vasant Panchami begin. Basant Panchami marks the onset of the Spring season and is dedicated to Saraswati Maa, Goddess of Knowledge and Learning. It is celebrated with a lot of enthusiasm in the northern, western and central parts of the country. Hindus in Nepal also observe this festival with much vigour. As per Hindu Calendar and Indian Calendar, Basant Panchami will be observed on the 5th day of Shukla Paksha in Magha Month. The reason why Basant Panchami is important is the association of this day to wisdom and learning. It is believed by many that Goddess Saraswati, the deity of wisdom, art, science, knowledge and music was born on this day. So, on this day devotees worship Maa Saraswati by performing Saraswati Puja, chanting Saraswati Mantra and visiting the temples of the Goddess. Another important legend associated with this beautiful festival is the story of Kama, the Hindu god of Love and his wife Rati. According to this legend, God Kamadeva was burnt to ashes by Lord Shiva for his wrongdoings. Consequently, his wife Rati had to undergo 40 days of strict penance to bring her husband, Lord Kama, back. It was on the auspicious occasion of Vasant Panchami that Lord Shiva finally yielded to her request and brought her husband back to life. From that day till today, Lord Kama, the god of love, along with his wife Rati are worshipped by devotees in several parts of India. Please Check: How do we observe Saraswati Avahan? Vasant Panchami also marks the beginning of the preparations of Holi and Holika Bonfire which occurs 40 days after this festival. In Hindu Astrology, the day of Vasant Panchami is considered Abhuja making it auspicious to start any work. This is the reason many marriages take place on this day. There are several traditions that are associated with a celebration of Basant Panchami. Different regions have different customs with which they observe this colorful festival. Majority of the devotees pay reverence to Goddess Saraswati on this day. 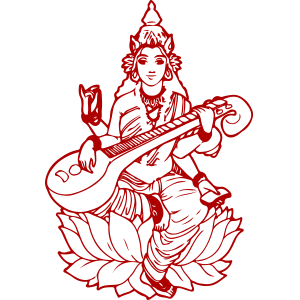 Devotees visit her temples and perform Saraswati Vandana and play music. Goddess Saraswati manifests creative energy and it is believed that those who worship her on this day are bestowed with knowledge and creativity. It is also believed that Yellow is the favorite color of Saraswati Maa, so people wear yellow on this day and prepare yellow dishes and sweets. Yellow cooked rice with saffron is the traditional feast in many parts of the country on Vasant Panchami. On the day of Vasant Panchami, Hindus read the Maa Saraswati Chalisa so that their future can be good. In many regions, Saraswati temples are filled with elaborate feasts a night prior so that the Goddess can join in the celebrations and the festivities with her devotees the next morning. As it is the day dedicated to the Goddess of Knowledge, some parents make it a point to sit with their children to make them study or write their first word and encourage learning. This significant ritual is referred to as Aksharabhyasam or Vidyarambham. In several educational institutions, the statue of Goddess Saraswati is adorned in yellow and then Saraswati Puja is performed where Saraswati Stotrams are recited by teachers and students alike to seek her blessings. Songs and poems on Basant Panchami are sung and recited on this day in many schools. Please Check: When is Saraswati Visarjan? On the other hand, some devotees dedicate this day to Lord Kamadeva and his wife Rati. It is considered as the day of love by many. To celebrate love and its various emotions, women and men dress up in saffron and pink and sing the different ragas of love and emotions and dance on the beats of dhols. In many areas such as Kutch, people gift each other a garland of flowers set with mango leaves as a token of love and affection. Some areas of Maharashtra, Uttar Pradesh, Chhattisgarh and Madhya Pradesh offer their prayers to Lord Shiva and Goddess Parvati on this day. A unique custom of devotees wearing jasmine garlands in Rajasthan is prevalent. It is mandatory for newly married couples to wear yellow outfits and visit the temple to offer prayers on their first Basant Panchami in some parts of Maharashtra. In Punjab, this festival is celebrated as the beginning of the spring season. They celebrate it with a lot of cheer and enthusiasm wearing yellow turbans and yellow dresses. Kite flying is another interesting tradition observed in Punjab on this day. Astrologers find the day of Vasant Panchami as Abujha or immensely auspicious. So, Saraswati Puja can be performed at any time of the day. Although, there is no specific Muhurat to perform the Puja it is advisable that Saraswati Vandana is done when Panchami tithi is prevalent and also during Purvahna Kaal, as it is not necessary that Panchami tithi prevails during the entire day. Saraswati Puja is done with the chanting of Saraswati Mantra and the popular Saraswati Stotram, Saraswati Ya Kundendu.